Home / Latest News / Keep your pets indoors! Every year we warn people how scary a place for animals Carcassonne will be on the 14th July. Every 15th of July we have scores of lost dog reports! France commemorates the start of the French Revolution with a national holiday on 14 July. So there will be mass celebrations up and down the country which inevitably involve fireworks! At the SPA we prepare ourselves as we know that we’ll get a large number of stray animals and lost dog reports on Sunday / Monday for animals that got spooked with the fireworks and happened to be outside at the time. Last year on the 15th we had 11 reports of lost dogs and then more during the week as people realised their dogs weren’t going to come home on their own! As a responsible dog owner, please do everything in your power to protect your dog tomorrow night which will be filled with loud bangs, pops and sizzles! Remember, your dogs hearing is 10 times more sensitive than yours! Your best bet is to keep your dog indoors somewhere where he is likely to do the least amount of harm to himself, and your house! You should also turn on the TV or a radio, with the volume turned up loud to make it less likely that he will be able to hear the fireworks outside. Since the flashing lights can scare your dog just as much s the loud noises, be sure to close all the curtains and blinds inside your home and turn ON all the lights in the room. This will make the bright lights from fireworks less noticeable to your dog. Plus, closed curtains and blinds offer a small degree of sound-proofing in your home, lowering the high pitched sounds a tiny bit. Make sure your dog has his collar and ID tags on. In the worst-case scenarios, dogs have been known to chew through crates, doors, and even jump out of windows due to their anxiety. Let your dog outside to toilet well before the fireworks begin. Have him on a leash, even in the garden. Exercise your dog earlier in the day by taking him on a longer-than-usual walk. This will tire him out and make him less likely to over-exert himself later if/when he becomes stressed from the sound of fireworks and play some music to drown out the fireworks noise! So please don’t take any risks, no matter how steady you think your dog is. It’s only one night a year and simply not worth the risk…keep all pets inside and safe! 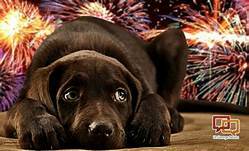 Fireworks scare pets..keep them indoor! Previous: Adoption of Max, Flakes and Candy!